One of the other massively failing right-wing economic policies the Australian economist John Quibbin tackles in his book Zombie Economics: How Dead Ideas Still Walk Among Us (Princeton: Princeton University Press 2010) is expansionary austerity. This is the full name for the theory of economic austerity foisted upon Europeans and Americans since the collapse of the banks in 2008. It’s also the term used to describe the policy generally of cutting government expenditure in order to reduce inflation. Quiggin shows how, whenever this policy was adopted by governments like the American, British, European and Japanese from the 1920s onwards, the result has always been recession, massive unemployment and poverty. The injustice of making hospital workers, police, and old age pensioners pay for the crisis, while the bankers who caused it are receiving even bigger bonuses than before, is glaringly obvious. So, just as with trickle-down economics, it was necessary to claim that everyone would be better off in the long run. It was here that the Zombie idea of expansionary austerity emerged from the grave. Alesina and Ardagna, citing their dubious work from the 1990s, argued that the path to recovery lay in reducing public spending. They attracted the support of central bankers, ratings agencies, and financial markets, all of whom wanted to disclaim responsibility for the crisis they had created and get back to a system where they ruled the roost and profited handsomely as a result. The shift to austerity was politically convenient for market liberals. Despite the fact that it was their own policies of financial deregulation that had produced the crisis, they used the pretext of austerity to push these policies even further. The Conservative government of David Cameron in Britain has been particularly active in this respect. Cameron has advanced the idea of a “Big Society”, meaning that voluntary groups are expected to take over core functions of the social welfare system. The Big Society has been a failure and has been largely laughed off the stage, but it has not stopped the government from pursuing a radical market liberal agenda, symbolized by measures such as the imposition of minimum income requirements on people seeking immigrant visas for their spouses. Although the term expansionary austerity has not been much used in the United States, the swing to austerity policies began even earlier than elsewhere. After introducing a substantial, but still inadequate fiscal stimulus early in 2009, the Obama administration withdrew from the economic policy debate, preferring to focus on health policy and wait for the economy to recover. Meanwhile the Republican Party, and particularly the Tea Party faction that emerged in 2009, embraced the idea, though not the terminology, of expansionary austerity and in particular the claim that reducing government spending is the way to prosperity. In the absence of any effective pushback from the Obama administration, the Tea Party was successful in discrediting Keynesian economic ideas. Following Republican victories in the 2010 congressional elections, the administration accepted the case for austerity and sought a “grand bargain” with the Republicans. It was only after the Republicans brought the government to the brink of default on its debt in mid-2011 that Obama returned to the economic debate with his proposed American Jobs Act. While rhetorically effective, Obama’s proposals were, predictably, rejected by the Republicans in Congress. At the state and local government level, austerity policies were in force from the beginning of the crisis. Because they are subject to balanced-budged requirements, state and local governments were forced to respond to declining tax revenues with cuts in expenditure. Initially, they received some support from the stimulus package, but as this source of funding ran out, they were forced to make cuts across the board, including scaling back vital services such as police, schools, and social welfare. The theory of expansionary austerity has faced the test of experience and has failed. Wherever austerity policies have been applied, recovery from the crisis has been halted. At the end of 2011, the unemployment rate was above 8 percent in the United States, the United Kingdom, and the eurozone. In Britain, where the switch from stimulus to austerity began with the election of the Conservative-Liberal Democratic coalition government in 2010, unemployment rose rapidly to its highest rate in seventeen years. In Europe, the risk of a new recession, or worse, remains severe at the time of writing. Although the U.S. economy currently shows some superficial signs of recovery, the underlying reality is arguably even worse than it now is in Europe. Unemployment rates have fallen somewhat, but this mainly reflects the fact that millions of workers have given up the search for work altogether. The most important measure of labour market performance, the unemployment-population ration (that is, the proportion of the adult population who have jobs) fell sharply at the beginning of the cris and has never recovered. On the other hand, the forecast for Europe in the future looks even bleaker as the consequences of austerity begins to bite. The reanimation of expansionary austerity represents zombie economics at its worst. Having failed utterly to deliver the promised benefits, the financial and political elite raised to power by market liberalism has pushed ahead with even greater intensity. In the wake of a crisis caused entirely by financial markets and the central banks and regulators that were supposed to control them, the burden of fixing the problem has been placed on ordinary workers, public services, the old, and the sick. With their main theoretical claims, such as the Efficient Markets Hypothesis and Real Business Cycle in ruins, the advocates of market liberalism have fallen back on long-exploded claims, backed by shoddy research. Yet, in the absence of a coherent alternative, the policy program of expansionary austerity is being implemented, with disastrous results. (pp. 229-32, emphasis mine). As for Alesina and Ardagna, the two economists responsible for contemporary expansionary austerity, Quiggin shows how their research was seriously flawed, giving some of their biggest factual mistakes and accuracies on pages 225 and 226. Underlying the Treasury’s opposition to fiscal stimulus, however, was a fear, entirely justified in terms of the consequences for market liberal ideology, that a successful interventionist macroeconomic policy would pave the way for intervening in other areas and for the end of the liberal economic order based on the gold standard, unregulated financial markets, and a minimal state. As the great Polish economist Michal Kalecki observed in 1943, market liberal fear the success of stimulatory fiscal policy more than its failure. If governments can maintain full employment through appropriate macroeconomic policies, they no longer need to worry about “business confidence” and can undertake policies without regard to the fluctuations of the financial markets. Moreover, workers cannot be kept in line if they are confident they can always find a new job. As far as the advocates of austerity are concerned, chronic, or at least periodic, high unemployment is a necessary part of a liberal economic order. The fears of the Treasury were to be realized in the decades after 1945, when the combination of full employment and Keynsian macro-economic management provided support for the expansion of the welfare state, right control of the financial sector, and extensive government intervention in the economy, which produced the most broadly distributed prosperity of any period in economic history. (p. 14). So the welfare state is being dismantled, the health service privatized and a high unemployment and mass poverty created simply to maintain the importance and power of the financial sector and private industry, and create a cowed workforce for industry. As an economic theory, austerity is thoroughly discredited, but is maintained as it was not by a right-wing media and political establishment. Robin Ramsay, the editor of Lobster, said in one of his columns that when he studied economics in the 1970s, monetarism was so discredited that it was regarded as a joke by his lecturers. He then suggested that the reason it was supported and implemented by Thatcher and her successors was simply because it offered a pretext for their real aims: to attack state intervention and the welfare state. It looks like he was right. In this 15 minute video from the Baltimore-based The Real News network, host Aaron Mate talks to Leon Panitch, professor of political science at York University about the proposals announced at the Labour party’s conference last month that Labour intended to renationalize some of the privatized utilities, introduce profit-sharing schemes and workplace democracy in firms with over 250 members, in which 1/3 of the board would be elected by the workers. The video includes a clip of John McDonnell announcing these policies, declaring that they are the greatest extension of economic democratic rights that this country has ever seen. He states that it starts in the workplace, and that it is undeniable that the balance of power is tipped against the worker. The result is long hours, low productivity, low pay and the insecurity of zero hours contracts. He goes on to say that Labour will redress this balance. They will honour the promise of the late Labour leader, John Smith, that workers will have full union rights from day one whether in full time, part time or temporary work. They will lift people out of poverty by setting a real living wage of ten pounds an hour. McDonnell also says that they believe that workers, who create the wealth of a company, should share in its ownership and the returns that it makes. Employee ownership increases productivity and improves long-term decision making. Legislation will be passed, therefore, for large firms to transfer shares into an inclusive ownership fund. The shares will be held and managed collectively by the workers. The shareholders will give the workers the same rights as other shareholders to have a say over the direction of their company. And dividend payments will be made directly to the workers from the fund. Commenting on these proposals, Panitch says that in some ways they’re not surprising. McDonnell stated that Labour would inherit a mess. But his remarks were different in that usually governments use the fact that they will inherit a mess not to go through with radical policies. Panitch then talks about Labour’s commitment to bring the public utilities – rail, water, electricity, the post office – public ownership, pointing out that these used to be publicly owned before Thatcher privatized them. McDonnell particularly focused on water, before going beyond it, citing the 1918 Labour party constitution’s Clause IV, which Blair had removed. This is the clause committing the Labour party to the common ownership of the means of production, distribution and exchange, under the best form of popular administration. And unlike previous nationalized industries, these will be as democratically-run as possible. Councils would be set up in the water sector made up of representatives of the local community and workers’ representatives to be a supervisory council over the managers in the nationalized water industry. They then go to a clip of McDonnell talking about the nationalization of the utilities. McDonnell states that the renationalization of the utilities will be another extension of economic democracy. He states that this has proved its popularity in opinion poll after opinion poll. And it’s not surprising. Water privatization is a scandal. Water bills have risen by 40 per cent in real terms since privatization. 18 billion pounds has been paid out in dividends. Water companies receive more in tax credits than they pay in tax. And each day enough water to meet the needs of 20 million people is lost due to leaks. ‘With figures like that’, he concludes, ‘we cannot afford not to take it back into popular ownership’. Mate and Panitch then move on to discussing the obstacles Labour could face in putting these policies into practice, most particularly from the City of London, which Panitch describes as ‘the Wall Street of Britain’, but goes on to say that in some ways its even more central to financialized global capitalism. However, Panitch says that ‘one gets the sense’ that the British and foreign bourgeoisie have resigned themselves to these industries being brought back into public ownership. And in so far as bonds will be issued to compensate for their nationalization, McDonnell has got the commitment from them to float and sell them. He therefore believes that there won’t be much opposition on this front, even from capital. He believes that there will be more resistance to Labour trying to get finance to move from investing in property to productive industry. He then moves on to talk about Labour’s plans for ten per cent of the stock of firms employing 250 or more people to go into a common fund, the dividends from which would passed on to the workers up to 500 pounds a year. Anything above that would be paid to the treasury as a social fund for meeting the needs of British people and communities more generally. Panitch states that this has already produced a lot of squawking from the Confederation of British Industry. Going to giving workers a third of the seats on the boards, Panitch states that it has already been said that it will lead to a flight of capital out of Britain. He discusses how this proposal can be radical but also may not be. It could lead to the workers’ representatives on these boards making alliances with the managers which are narrow and particular to that firm. The workers get caught up in the competitiveness of that firm, it stock prices and so on. He makes the point that it’s hardly the same thing as the common ownership of the means of production to have workers’ sitting on the boards of private companies, or even from workers’ funds to be owning shares and getting dividends from them. Nevertheless, it is a step in the right direction of socializing the economy more generally, and giving workers the capacity and encouraging them to decide what can be produced, where it’s produced, and what can be invested. And if it really scares British and foreign capital, this raises the question of whether they will have to introduce capital controls. Ultimately, would they have to bring the capital sector into the public sphere as a public utility, as finance is literally the water that forms the basis of the economy? Mate then asks him about Labour’s refusal to hold a second referendum on Brexit, which angered some activists at the conference. Labour said that any second referendum could only be about the terms of the exit. Panitch states that people wanting Britain to remain in a capitalist Europe try to spin this as the main priority of the party’s members, even Momentum. He states that this is not the case at all, and that if you asked most delegates at the conference, most Labour members and members of Momentum, which they would prefer, a socialist Britain or a capitalist Europe, they would prefer a socialist Britain. The people leading the Remain campaign on the other hand aren’t remotely interested in a socialist Britain, and think it’s romantic nonsense at best. He states that the Corbyn leadership has said that they want a general election as they could secure an arrangement with Europe that would be progressive without necessarily being in Europe. They would accept the single market and a progressive stand on immigration rather than a reactionary one. They did not wish to endorse a referendum, which the Tories would have the power to frame the question. And this is particularly because of the xenophobic and racist atmosphere one which the initial Brexit vote was based. Panitch states that he is a great critic of the European Union, but he would have voted to remain because the debate was being led by the xenophobic right. He ends by saying that capital is afraid of the Trumps of this world, and it is because of the mess the right has made of things here in Britain with the Brexit campaign that capital might give a little bit more space for a period at least to a Corbyn government. This latter section on Brexit is now largely obsolete because Labour has said it will support a second referendum. However, it does a good job of explaining why many Labour supporters did vote for Brexit. The editor of Lobster, Robin Ramsay, is also extremely critical of the European Union because of the way neoliberalism and a concern for capital and privatization is so much a part of its constitution. Otherwise, these are very, very strong policies, and if they are implemented, will be a very positive step to raising people out of poverty and improving the economy. Regarding the possibility that the representatives of the workers on the company boards would ally themselves with capital against the workers, who put them there, has long been recognized by scholars discussing the issue of workers’ control of industry. It was to stop this happening that the government of the former Yugoslavia insisted that regular elections should be held with limited periods of service so that the worker-directors would rotate. Ha-Joon Chan in his books criticizing neoliberal economics also makes the points that in countries like France and Germany, where the state owns a larger proportion of firms and workers are involved in their companies through workers’ control, there is far more long-term planning and concern for the companies success. The state and the workers have a continuing, abiding interest in these firms success, which is not the case with ordinary investors, who will remove their money if they think they can get a better return elsewhere. My concern is that these policies will be undermined by a concentrated, protracted economic warfare carried out against the Labour party and the success of these policies by capital, the CBI and the Tories, just as the Tories tried to encourage their friends in industry to do in speeches from Tweezer’s chancellors. These policies are desperately needed, but the Tory party and the CBI are eager to keep British workers, the unemployed and disabled in poverty and misery, in order to maintain their control over them and maximise profits. RT: Does MI5 Let Its Informants Commit Crimes? This is another report from RT, which I don’t recall seeing reported in the British lamestream media. In this video put up on YouTube on 5th October 2018, the broadcaster’s reporter, Anastasia Churkina, discusses a court case being brought to a tribunal by four human rights groups, including Privacy International and Reprieve. They allege that MI5 has a policy of allowing its informants take part in serious crimes, such as murder, torture, sexual assault or other serious criminality, if it is in the public interest, according to their QC, Ben Jaffey. This policy is supposed to have gone on for three decades, in various guises and under various prime ministers. Amongst the evidence is a heavily redacted note, and a letter from David Cameron to a judge involved in trying these cases, telling him that it has been government policy. It also tells him that such oversight does not provide endorsement of the legality of the policy, and that he would not be required to provide a view on whether any one particular case should be referred for prosecution. This won’t surprise anyone, who’s read Lobster. The magazine, edited by Robin Ramsay, and now online, was set up to publicise and discuss real conspiracies by the western intelligence agencies to subvert the usual political processes. This has meant the overthrow of foreign governments that America and its allies find inconvenient or which pose a threat to American corporate or political interests. Which meant the CIA organizing coups to overthrow democratically elected left-wing regimes in South America, like Chile and Guatemala, and Britain and America collaborating in the overthrow of Mohammed Mossadeq in Iran. It has also meant the monitoring and smearing of left-wing activists and political opponents in America and Britain. Domestically, there is much evidence that MI5 and the SIS collaborated with Loyalist paramilitaries in Northern Ireland, operating as death squads against leading Republicans. Over on this side of Irish Sea, there is a lot of evidence very strongly suggesting that MI5 were behind the 1970s smears against Harold Wilson that he was a KGB spy. There have also been serious questions about the deaths of Hilda Murrell and Blair Peach. I don’t doubt that the groups bringing this case are absolutely right. Regarding the two groups named, Privacy International was launched in the 1990s to stop Britain becoming a surveillance state, in which the government uses electronic means to gather information on its citizens. These include the biometric ID cards and the plans for an ‘electronic bourse’ – basically, forms of electronic payment by card. The government has been keen to promote this scheme as it means that they can track how citizens spend their money. Reprieve, from what I gather, is an organize that campaigns against the death penalty around the world. It has launched internet petitions calling on the government to intervene in the case of Britons imprisoned abroad and facing the death penalty, as well as direct appeals to the foreign governments involved. It’s kind of like Amnesty International. I am really not surprised that RT seems to have been the only broadcaster to carry this story, unless I’m mistaken. Fleet Street really wouldn’t like to report on it, because it has been alleged that some of the right-wing press have connections to the intelligence agencies and have served as conduits for their propaganda. Like the Sunday Times when it was edited by Andrew Neil. Part of the anti-Semitism smear campaign against the Labour party is the attempt to foist upon it and wider society the definition of anti-Semitism formulated by the International Holocaust Remembrance Alliance, which specifically includes criticism of Israel. Although, as Mike points out, the definition only states that such criticism may be anti-Semitic, but not necessarily so in all cases. Nevertheless, this is how the IHRA’s definition is interpreted by the Israel lobby, and why it is being used to attack and smear decent, anti-racists when they object to it or question it. Jackie Walker, one of the vice-chairs of Momentum, was accused and vilified as an anti-Semite, despite her own Jewishness, precisely because she questioned this definition and the exclusive focus of Holocaust Remembrance Day on the Nazis’ attempts to exterminate the Jews, rather than include other races, who had also suffered their own genocides. The IHRA’s definition of anti-Semitism is completely ahistorical and just wrong. Anti-Semitism, as defined by Wilhelm Marr, the man, who coined the term and founded the Bund Antisemiten – ‘League of Anti-Semites’ – in 19th century Germany stated that it was hatred of Jews as Jews, regardless of religion. And this was well before the foundation of Israel. Mike has also several times posted the views of a very senior lawyer on this issue, that this is indeed the proper definition of anti-Semitism. But this is not what the Israel lobby wants people to believe. And so when Corbyn met the Board of Deputies of British Jews a few weeks ago, after they organised a demonstration smearing Labour and its leader once again as anti-Semitic, they pressured him yet again to adopt the HRA’s spurious definition. If adopted, it would make criticism of Israel and its ethnic cleansing of the Palestinians extremely difficult, if not impossible. The article also includes this handy timeline giving the important dates in the development of this project. Following is a timeline of some of the key events in the creation, promotion and adoption of the Israel-focused definition of antisemitism. It provides an outline, but does not include every step of the process, all the key players, or every action. 1991 – Jean Kahn is elected president of the European Jewish Congress at its plenary session in Israel. He announces an ambitious agenda, including demonstrating solidarity with Israel and European countries coordinating legislation to outlaw antisemitism. 2004 – Sharansky, who is also chair of the Jewish Agency for Israel, issues a position paper that lays out the “3-D Test of Anti-Semitism:” statements that “demonize” Israel, apply a “double standard” or “delegitimize” Israel are “antisemitic.” These will form the blueprint for new definitions adopted by lobbying organizations and finally governments. 2004 – American Jewish Committee directors Kenneth Stern and Rabbi Andrew “ Andy” Baker work with Israeli professor Dina Porat to draft a new antisemitism definition and push the Monitoring Centre to adopt it, according to Stern. Their draft drew on Sharansky’s 3 D’s. 2005 – Monitoring Centre issues a “Working Definition of Anti-Semitism” that includes Sharansky’s 3 D’s, based on Stern et al’s draft. While standard dictionary definitions of antisemitism didn’t even mention Israel, fully half of the newly devised Monitoring Centre definition referred to Israel. 2007 – UK’s National Union of Students (NUS) adopts the new antisemitism definition focused on Israel, after pro-Israel students introduce a motion misleadingly entitled “AntiRacism: Challenging Racism on Campus and in Our Communities.” Some student unions at various UK universities then follow suit. 2009 – The Inter-parliamentary Coalition for Combating Antisemitism (CCA), which brings together parliamentarians from around the world, issues the London Declaration signed by then British Prime Minister Gordon Brown and others. The Declaration calls on governments to use the Monitoring Centre definition and to outlaw and prosecute such “antisemitism.” US Congressmen Ted Deutch and Chris Smith are members of the CCA’s steering committee. 2010 – Second US State Department Special Envoy on antisemitism Hanna Rosenthal officially adopts European Monitoring Centre definition; this is subsequently referred to as the State Department definition of antisemitism. Rosenthal creates course on antisemitism using this definition to train Foreign Service Officers. 2012 – Louis D. Brandeis Center for Human Rights Under the Law is founded and immediately begins promoting the new definition. Within a year it launches an initiative to establish student chapters at law schools throughout the U.S.
2014 – Mark Weitzman, Director of Government Affairs at the Simon Wiesenthal Center, with help from Ira Forman and Nicholas Dean of the U.S. Department of State, initiates efforts for another agency to adopt and promote the working definition of antisemitism. 2015 – European Commission creates a special position to coordinate work on combating antisemitism, appointing German Katharina von Schnurbein to the post. Schnurbein proceeds to promote use of the Israel-centric definition. 2015 – Indiana University passes resolution denouncing “anti-Semitism as defined by the United States State Department and will not fund or participate in activities that promote anti-Semitism or that ‘undermine the right of the Jewish people to self-determination.’” University of California Santa Barbara and UCLA also pass such resolutions. December 2016 – UK announces it will formally adopt the Israel-centric definition–the first country to do so besides Israel. UK Prime Minister Theresa May made the announcement during a talk before 800 guests at the Conservative Friends of Israel’s annual lunch. December 2016 – Adoption of the definition by the 57-member Organization for Security and Cooperation in Europe (OSCE), which had been heavily lobbied by the American Jewish Committee, is blocked by Russia. The AJC then says it will push for individual member states to adopt it. March 2017 – South Carolina House of Representatives passes legislation under which the State Department’s definition “would be used in probes of possible anti-Semitism at state colleges and universities.” The Senate version will be discussed in 2018. Similar bills are being considered in Virginia and Tennessee. March – May 2017 – Resolutions adopting the Israel-centric definitions are passed by student governments at Ohio’s Capital University and Kent State, California’s San Diego State University and at other campuses around the U.S. The ADL, which uses Israel-centric definition of antisemitism, announces that antisemitism has risen by 86 percent in 2017, but includes questionable statistics. News organizations throughout the U.S. report the ADL claim. Reports that Trump administration budget cuts might cause special antisemitism envoy position to remain vacant provokes outrage among Israel lobby groups and others. Samantha Power calls for entire Trump administration to focus on antisemitism. Soon, Trump administration says it will fill post. All 100 US Senators send a letter to UN demanding it stop its actions on Israel and connects these to antisemitism. Israel-Britain Alliance begins asking candidates for Parliament to sign a pledge that they will support the new definition. Guido Fawkes: Drugged Up Raver! The latest round of anti-Semitism smears and faux outrage against Jeremy Corbyn for attending a Passover Seder with the ‘wrong sort of Jews’ in Jewdas, came after Guido Fawkes leaked news of it on his website. Guido Fawkes is a right-wing, political gossip site, which has regularly run smears and falsehoods against the left. And, indeed, other Tories, when it suits him. Guido Fawkes himself is Paul Staines, a Libertarian Tory with a with a very unpleasant political past. He used to be a member of British Briefing, editing their magazine. This was an organisation of industrialists and company directors, who compiled black lists of trade unionists and socialist activists. He was also a member of a fringe Libertarian group in the Tory party, who invited the commander of a South American Fascist death squad as Guest of Honour to their annual dinner. This is a man, who was responsible for unimaginable atrocities in his country, too horrific to be decently put in a website like this. Fawkes has no business smearing anyone as a Fascist, or anything remotely like it. Now, it seems, Staines was also part of the illegal rave seen in the 1980s. Robin Ramsay has added a very interesting article by Nick Must, ‘South of the Border’, to the latest issue of Lobster, which describes how the future Guido Fawkes was off his head much of the time on MDMA, an hallucinogenic much favoured by drug gurus and ravers. See the snippet ‘Paul Staines and the Cheesy Quavers’. Go to the Lobster website, look at the present issue, 75, and click on the Must’s article to see it. The illegal raves scene in the 1980s was run by the rich children of the Tory elite out of Tory Central office, at the same time that Maggie Thatcher was trying to crack down on it as a threat to law and order. I’ve also heard rumours that they also went off to hold dissolute parties at Ibiza, long before it was taken over by the proles. Someone, who had seen what they got up to out there, is supposed to have said it was like ‘the Fall of Rome’. So much for Fawkes as the guardian of political morality. I’m just surprised he’s got a few brain cells left. There has never been, to be sure, a single, monolithic Communist Conspiracy of the sort postulated by the American John Birch Society in the 1950s and 1960s. Nor has there ever been an all-encompassing International Capitalist Conspiracy, a Jewish World Conspiracy, a Masonic Conspiracy, or a Universal Vatican Conspiracy. And nowadays, contrary to the apparent belief of millions, neither a vast Underground Satanist Conspiracy nor an Alien Abduction Conspiracy exists. This reassuring knowledge should not, however, prompt anyone to throw out the baby with the bath water, as many academics have been wont to do. For just as surely as none of the above mentioned Grand Conspiracies has ever existed, diverse groups of Communists, capitalists, Zionists, masons and Catholics have in fact secretly plotted, often against one another, to accomplish various specific but limited political objectives. No sensible person would claim, for example, that the Soviet secret police has not been involved in a vast array of covert operations since the establishment of the Soviet Union, or that international front groups controlled by the Russian Communist Party have not systematically engage in worldwide penetration and propaganda campaigns. it is nonetheless true that scholars have often hastened to deny the existence of genuine conspiratorial plots, without making any effort to investigate them, simply because such schemes fall outside their own realm of knowledge and experience or – even worse – directly challenge their sometimes naïve conceptions about how the world functions. If someone were to say, for example, that a secret masonic lodge in Italy had infiltrated all of the state’s security agencies and was involved in promoting or exploiting acts of neo-fascist terrorism in order to condition the political system and strengthen its own hold over the levers of government, most newspaper readers would probably assume that they were joking or accuse them of having taken leave of their senses. Ten years ago I might have had the same reaction myself. Nevertheless, although the above statement oversimplifies a far more complex pattern of interaction between the public and private spheres, such a lodge in fact existed. It was known as Loggia Massonica Propaganda Due (P2), was affiliated with the Grand Orient branch of Italian masonry, and was headed by a former fascist militiaman named Licio Gelli. In all probability something like P2 still exists today in an altered form, even though the lodge was officially outlawed in 1982. Likewise, with the claim that an Afrikaner secret society, founded in the second decade of this century [the 20th], had played a key role in establishing the system of apartheid in South Africa, and in the process helped to ensure the preservation of ultra-conservative Afrikaner cultural values and Afrikaner political dominance until 199. (sic). Yet this organisation also existed. It was known as the Afrikaner Broederbond (AB), and it formed a powerful ‘state within a state’ in that country by virtue, among other things, of its unchallenged control over the security services. There is no doubt that specialists on contemporary Italian politics who fail to take account of the activities of P2, like experts on South Africa who ignore the AB, are missing an important dimension of political life there. Nevertheless, neither of these to important organisations has been thoroughly investigated by academics. In these instances, as is so often the case, investigative journalists have done most of the truly groundbreaking preliminary research. (pp. 21-2). To accept these unstated proposition uncritically could induce a person, among other things, to overlook the bitter nineteenth century struggle between political secret societies for, at least, between revolutionaries using non-political secret societies as a ‘cover’ and the political police of powerful states like Austria and Russia, to minimise the role played by revolutionary vanguard parties in the Russian and communist Chinese revolutions, or to deny that powerful intelligence services like the CIA and the KGB have fomented coups and intervened massively in the internal affairs of other sovereign states since the end of World War II. In short, it might well lead to the misinterpretation or falsification of history on a grand scale. It is easier to recognise such dangers when relatively well-known historical development like these are used as illustrative examples, but problems often arise when the possible role played by conspiratorial groups in more obscure event is brought up. It is above all in these cases, as well as in high-profile cases where a comforting ‘official’ version of events has been widely diffused, that commonplace academic prejudices against taking covert politics seriously come into play and can exert a potentially detrimental effect on historical judgements. (p. 21-2, my emphasis). There is probably no way to prevent this sort of unconscious reaction in the current intellectual climate, but the least that can be expected of serious scholars is that they carefully examine the available evidence before dismissing matters out of hand. The proposals by YouTube, the Beeb and the Tory Party to set up monitoring groups to rebut ‘fake news’ go far beyond normal academic prejudice against taking real secret politics seriously. They are an attempt to present a very comforting official version of politics, which in the case of the Tory party means suppressing and falsifying the horrific assault their policies have had on British institutions, industry, and people since Maggie Thatcher. They are trying to shore up the decaying economic edifice of neoliberalism by presenting its opponents as wild-eyed radicals in the grip of loony conspiracies, producing ‘fake news’. And the same is true of Israel lobby, which tries to hide its attempts to pervert British and American politics through lobbying and the sponsorship of leading politicians. It also uses the existence of malign, anti-Semitic conspiracies as a weapon to smear genuine historians and activists, who support the Palestinians in their struggle for dignity and equality, or simply want to correct their lies, as anti-Semites. People like Mike, Tony Greenstein, Jackie Walker, Ken Livingstone and so many, many others. They need to be stopped. Now. The article is available at the magazine’s website. However, early issues, like 29 are behind a paywall. The editor, Robin Ramsay, has also written a book on conspiracies, where he makes the same distinction. Lobster: Torygraph Running MI5 ‘Red Scare’ Stories against Labour Again. Robin Ramsay, the editor of Lobster, has some very interesting comments about the recent libels in the Torygraph about Jeremy Corbyn meeting a Czech spy, going under cover as a diplomat, in his ‘The View from the Bridge’ column in the latest issue, no. 75.. Or rather, not about that story so much – he considers most of it invention, especially the part about money changing hands – but about another story in the same issue of the Torygraph about Rob Hayward. Hayward was the General Secretary of the Labour Party from 1972 to 1982. According to the Torygraph article, he had secret meetings with KGB officials at the Russian Embassy, where he talked about circumventing the power of the parliamentary Labour party, which would allow him to come out with the same agenda alongside the Communists. The article was written by one Giles Udy, who is described in his publisher’s blurb as a member of the council of the Keston Institute. Schapiro wrote books for, and Reddaway was a member of, the Information Research Department (IRD) the Foreign Office’s anti-subversion, anti-Soviet organisation about which a great deal has been written, not least in these columns. Schapiro was also a member, and briefly chair of, Brian Crozier’s Institute for the Study of Conflict (ISC). 6 In other words, the Keston Institute is a product of the Anglo-American anti-Soviet and anti-communist apparatus created during the Cold War. This explains why Mr Udy was given access to surveillance tapes of the Soviet embassy in London. If it isn’t funded by them, Keston liaises with the British security and intelligence services. With the arrival of Jeremy Corby and a left-leaning Labour Party membership, the dust is being blown off a lot of old files all over Whitehall . . . . The Cold Warriors are back. All the bug-eyed paranoiacs, who were convinced that Harold Wilson was a KGB spy, whose number included James Jesus Angleton, the head of the CIA, and Margaret Thatcher, are now back at it running red scare stories against Jeremy Corbyn. ‘Cos he threatens the course of western capitalism by wanting to renationalise the health service, parts of the national grid and the railways. And this is clearly enough to panic the secret state’s guardians of neoliberalism, the same kind of people who used to rant about ‘union subversion’ and thought up schemes to have left wingers, including journos, interned somewhere in the Hebrides or Shetland after a right-wing coup had overthrown the Labour government. Lobster is at https://www.lobster-magazine.co.uk/. Go to number 75 on the side column, click on it, and open ‘The View From the Bridge’. This piece about the Torygraph is entitled ‘Just Like Old Times’, because, obviously, it is just like old times when the British Secret State was doing its level best to bring down Labour. 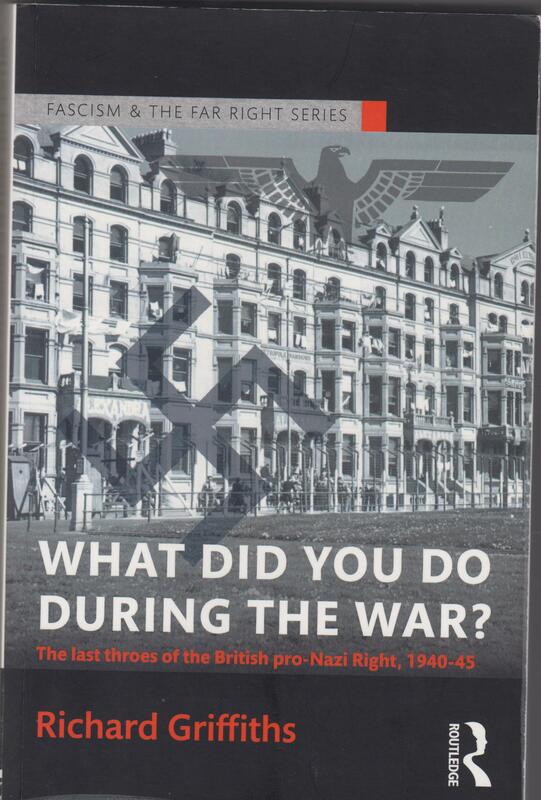 I put up a post this morning about a book I’ve reviewed for Lobster, the conspiracy/parapolitics magazine, of Richard Griffiths ‘What Did You Do in the War?’ on the activities of the British Fascist and pro-Nazi right from 1940 to 1945. This has been rather late being posted, as the webmaster is very busy with work. I am very pleased to say that it has now gone up, along with the first parts of Lobster 75, the new issue of the magazine for summer 2018. The magazine comes out twice yearly. Apart from my article, there is editor Robin Ramsay’s own column and roundup of news of interest to parapolitics watchers, ‘The View from the Bridge’, Garrick Alder on how Richard Nixon also tried to steal documents covering his lies and crimes in Vietnam, and his sabotage of the 1968 peace talks years before the Watergate scandal. Part II of Nick Must’s article on using the UK Foia. There is also a review of Jeffrey M. Bale’s book The Darkest Parts of Politics, which is an extensive examination of corruption, violence, terror committed by governments and political organisations around the world; And John Newsinger’s devastating review of Gordon Brown’s My Life, Our Times. Brown’s book is intended to present him as some kind of lefty, but Newsinger shows that instead Brown was a consistent supporter of Blair’s neoliberalism, who had no qualms about sucking up to Rupert Murdoch and Paul Dacre, with whom he is still friends. He also wanted to impose a graduate tax following Blair’s imposition of student fees. He also argues that Brown’s protestations of innocence about the claims that Saddam Hussein had weapons of mass destruction is similarly unconvincing. Brown claimed that MI6 lied to them. Newsinger argues instead that either Brown’s very naïve, or he’s also lying. And he shows how the humiliation the British army has suffered in Basra in Iraq and Afghanistan was due to cuts imposed by New Labour. Oh yes, and Brown’s also a close friend of Benjamin Netanyahu, the right-wing maniac now running the Israeli government and ethnically cleansing the Palestinians. He also argues that if Brown had won the 2010 election, austerity would now be imposed by a New Labour government, there would be a state visit arranged for Donald Trump – Brown recently went over there to give a very sycophantic speech to Congress, as well as more privatisation, more cuts to welfare services, and the graduate tax. Lobster 75 is at https://www.lobster-magazine.co.uk/issue75.php. Please read, if you’re interested in knowing what’s really going on behind the lies of the lamestream press.